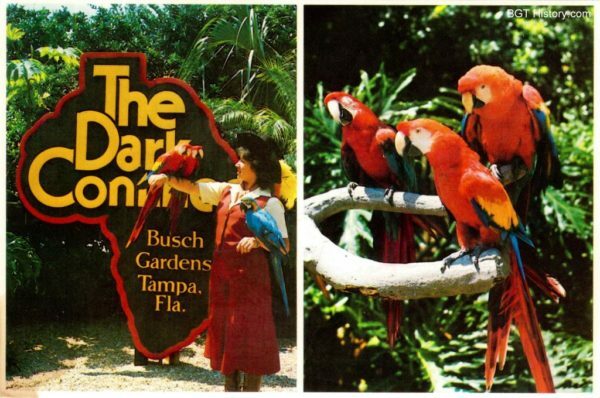 The “original” Busch Gardens, the Bird Gardens area is where it all began for the Tampa park with lush tropical gardens and exotic birds. 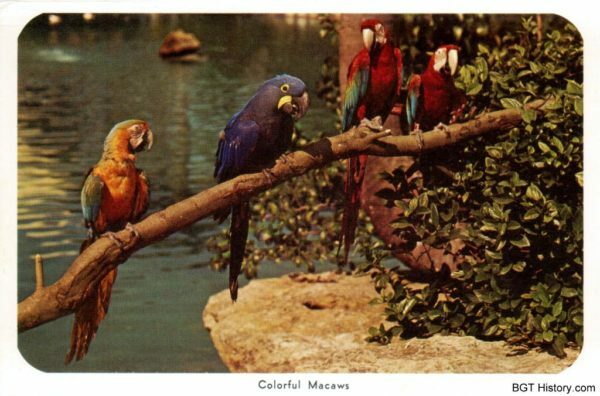 Today, guests will still find a variety of gardens and birds throughout the area, along with newer additions like the Australian themed Walkabout Way area. 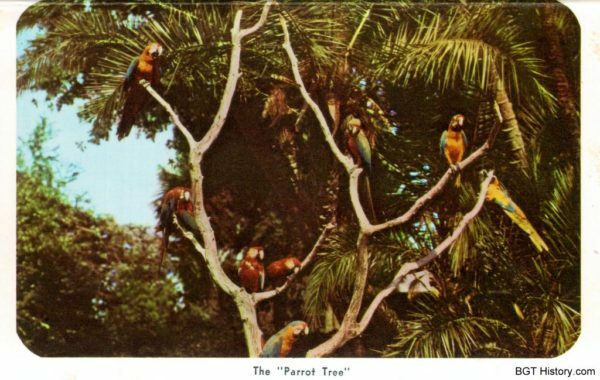 The Bird Gardens section began as 15 acres filled with tropical foliage and some 1,400 exotic birds, many of them free-roaming. 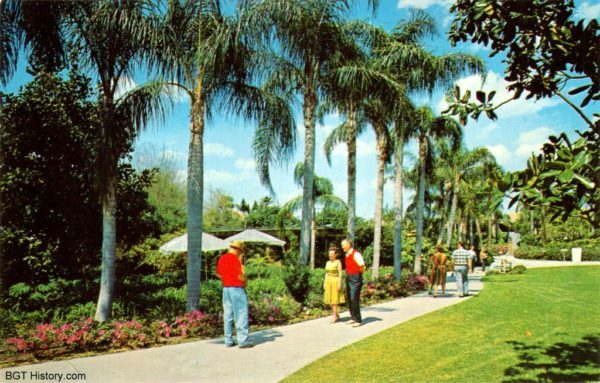 Outside of the brewery tour and free samples at the Hospitality House, the gardens were the main attraction for many early visitors to the park. 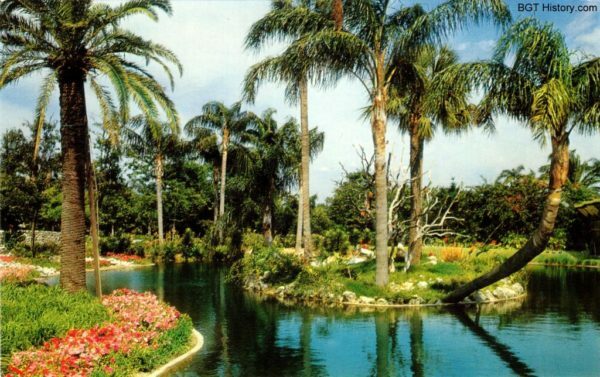 By 1967, it was reported this section of the park held some 100,000 flowers and 150,000 other plants including trees and shrubs. 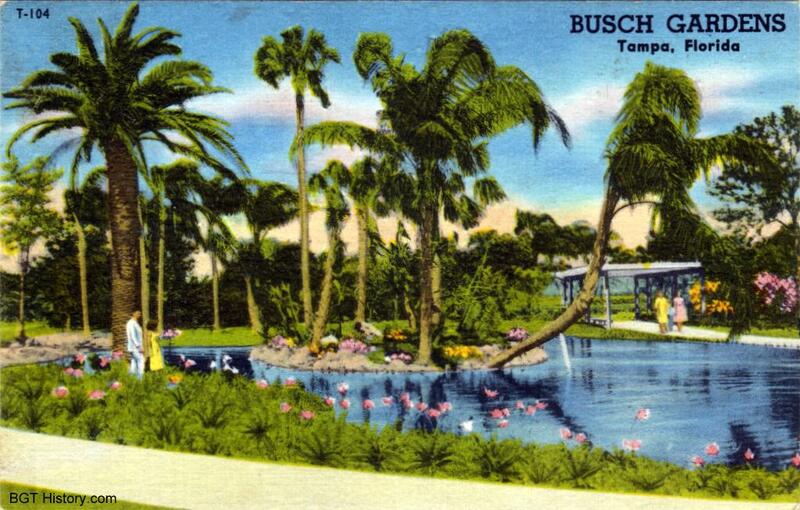 In addition to the pathways that allowed guests to wander through the gardens, early attractions included the Amphitheater with free shows with performing birds, the Adolphus Busch Space Frame (also known as the Geodesic Dome) which held some of the more rare birds, and Dwarf Village, which featured scenes from popular children’s tales in miniature. 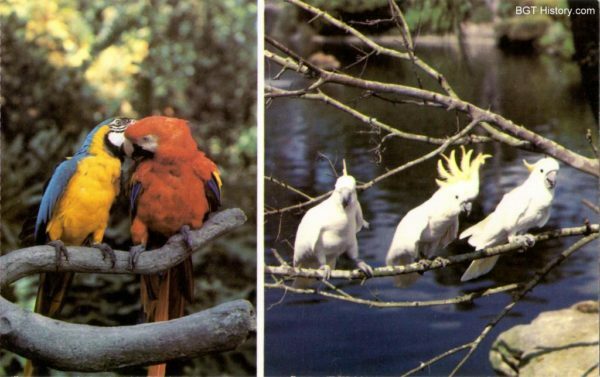 By 1977, it was reported there were some 2,500 exotic birds as part of the area, along with a bird show and a puppet show. An all new experience, an interactive Pumpkin Patch, debuted on the lawn between Xcursions and Walkabout Way on October 5, 2011. There was a children’s hay maze, various games and crafts, fall themed photo ops, special appearances from Sesame Street characters The Count and Abby Cadabby, and the option to purchase and paint pumpkins to take home. The Pumpkin Patch was open daily and ran through November. For Easter in 2012, a new experience was offered on the lawn outside Xcursions. An egg hunt was held five times daily, with every child receiving a gift for participating. There was also a craft station, photos with the Easter Bunny, and a Pick-a-Pop game. Participation in the egg hunt and craft station was $5, and a photo with the Easter Bunny was available for $10. 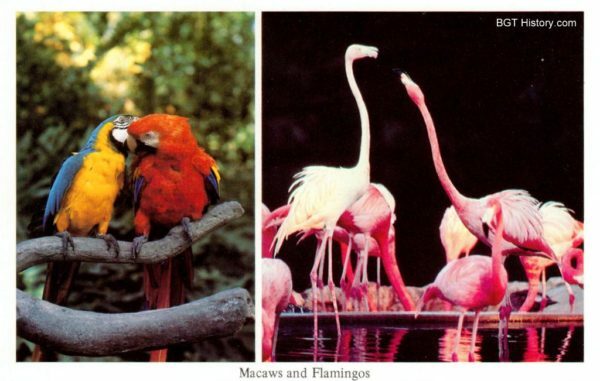 As of Summer 2012, there were two species of peacock roaming around the area – Indian and Javan. 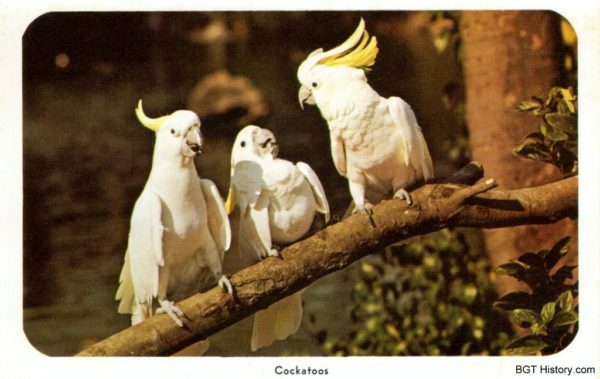 There were four Indian peacocks – two white females, one white male, and one blue female. One of the white females “adopted” Javan peacock chicks, who were born to their parents that resided in the Jungala section of the park. Easter festivities returned to the lawn outside Xcursions in 2013. 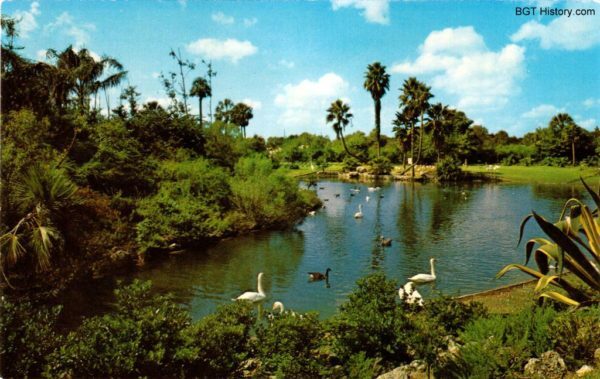 From mid-March through Easter Day, March 31, guests could participate in an egg hunt, held each hour from 10 a.m. to 5 p.m. daily. There were also crafts, games, and a photo opp with the Easter Bunny. Pricing remained the same as it was in 2012. From April 14 – 21, the Easter Bunny was available for pictures at select times beginning at 11:30 a.m. daily on the deck overlooking the flamingo habitat. 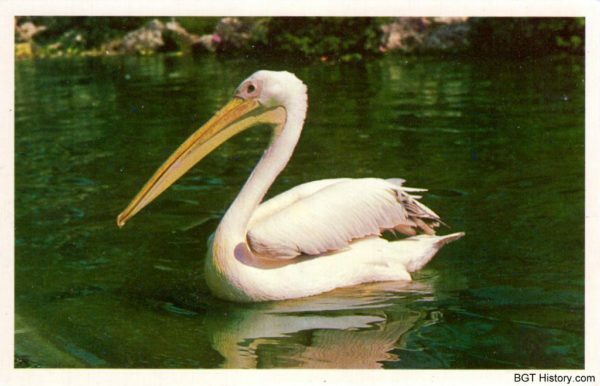 Additional details and images about Bird Gardens will be added in the future.